RESOLVED THAT pursuant to Sections 196, 203 and other applicable provisions of Companies Act, 2013 (including corresponding provisions, if any of the Companies Act, 1956) and the Companies (Appointment and Remuneration of Managerial Personnel) Rules, 2014, approval of the Board be and is hereby accorded for the appointment of Shri _______________ as Whole Time Director of the Company for a period of _____ years from _______________, on the remuneration and on such terms and conditions as set out below with liberty and authority to the Board of Directors to alter and vary the terms and conditions of the said appointment from time to time within the scope of Schedule V of the Companies Act, 2013, or any amendments thereto or any re-enactment thereof as may be agreed to between the Board of Directors and Shri _______________. i. Salary at the rate of Rs. -------------- (Rupees ------------- only) per month w.e.f-------------------, which may be reviewed by the Board. iv. The Whole Time Director shall be entitled to participate in provident fund, gratuity fund or such other schemes for the employees, which the company may establish from time to time. v. Reimbursement of medical and hospitalization expenses of the Whole Time Director and his family in accordance with the Company policy. vi. LeaveTravel Allowance for the Whole Time Director and his family once in a year in accordance with the Company policy. Vii. Bonus for the financial year, at the discretion of the board. Viii Reimbursement of expenses incurred by him on account of business of the Company in accordance with the Company policy. ix. Reimbursement of any other expenses properly incurred by him in accordance with the rules and policies of the Company. x. 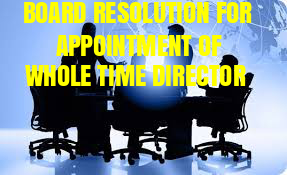 The Whole Time Director shall be entitled to such increment from time to time as the Board may by its discretion determine. FURTHER RESOLVED THAT the Board of Directors of the Company be and is hereby authorized to take such steps as may be necessary, desirable or expedient to give effect to this resolution.